I’ve been coaching a high-school student (and his father!) on the intricacies of building a self-balancing robot; they’re doing all the hard work and I’m running interference with techie bugs. This one turned out to be particularly nasty. It seems all versions of Raspberry Pis have an I2C bus hardware problem preventing them from working correctly with Adafruit’s Bosch BNO055 (yes, “bee en oh zero five five”) Absolute Position Sensor. 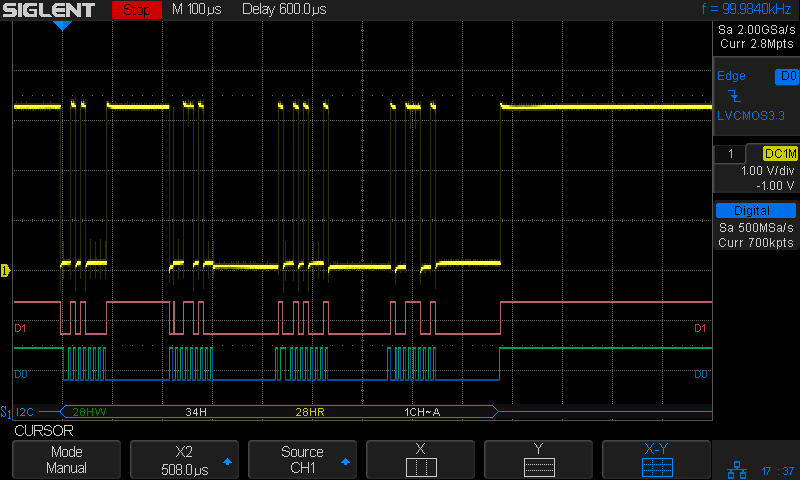 The problem has been variously diagnosed as being due to the Pi’s inability to handle clock stretching in arbitrary parts of the I2C transaction and the BNO055 chip’s exquisite sensitivity to I2C bus levels, but it’s worse than that. He now knows why you must always leading-zero-fill binary values. The shorter values say the chip ran at 26 °C, which means the longer values have a bogus binary 1 in bit 7. 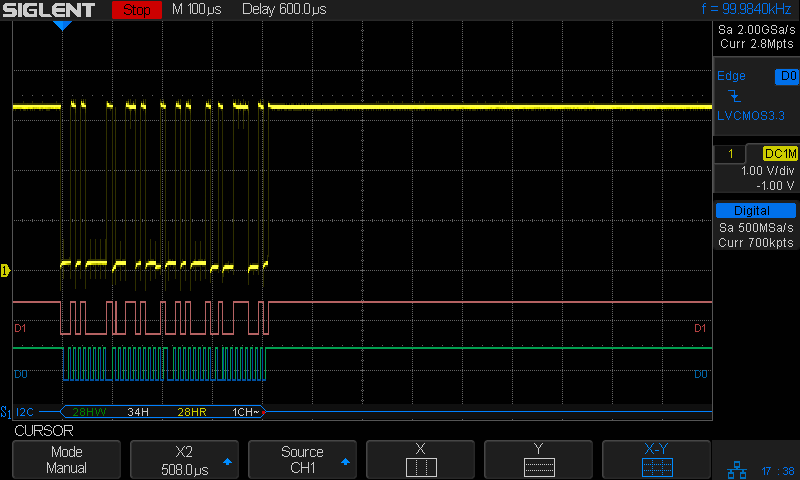 I2C bus transfers proceed MSB-first, so the Pi occasionally reads a bogus 1 at the first clock transition while reading the single temperature byte from the BNO055. After some flailing around, we observed two types of I2C bus transactions. Contrary to what one might think from the lead-in description, the non-stretched version always produces the incorrect leading bit and the stretched version usually delivers the correct result. He had previously installed the clock stretch workaround and we verified it was active. Turning it off had no effect, as did turning it back on again. The value uses units of the SCL period, so the modified value of 20000 produces 20×103 counts of 1/(100 k bit/s) = 2 s, far longer than any delay we observed. In fact, the default 640 μs would (apparently) suffice for the BNO055. I installed the Adafruit-recommended pullup resistors and we verified they had no effect. We noticed, but I did not record, nasty positive-going pulses on both SDA and SCL which were not due to noise or supply problems. As far as I can tell, the Pi does not maintain control over the I2C bus lines during some phases of the transaction, perhaps when the BNO055 invokes clock stretching, allowing the pullups to produce narrow upward glitches crossing the logic threshold. This will merit further study. Slowing to 50 kb/s produced intermittent errors, while 25 kb/s seemed to completely eliminate them. This contradicts suggestions of proper operation at any speed other than the default 100 kb/s. Note: this applies to a single-byte data value and longer transactions remain to be tested.